Rated 5 out of5 byPrinces Burger and Gucci fromMy cats go CRAZY for them!! !My cats love them so much that they try to get them as early as possible. Both of my cats just gobble them up and always want more!! Rated 5 out of5 byMaureen frommy cat loves these treatsMy cat loves these treats I used them when I need to cut his nails or brush out tangles in his long coat. Works everytime for me. Rated 5 out of5 byJenn fromAwesome productI buy this all the time for my cat. We do not allow it to run out because my cat loves these. He Cries at the cupboard door. Rated 5 out of5 byPandora84 fromMy Fur Baby Lives Her TreatsMy Little fur ball adores her treats. She goes crazy when it's snack time. She always wants more, these are so loved at home. Rated 5 out of5 byLauren fromMy cats love them!As you can see by the photo attached, my cat LOVES temptations!! She couldn't resist opening the bag herself! Rated 5 out of5 byDestiny123 fromGreat Brand :)I always buy my cat Temptation treats and she loves them, and i always pick this brand over others. Rated 5 out of5 byQuill fromMy hedgehog loves these! !My hedgehog loves these. He loves all the flavors we have tried. They are his favorite treat!! Rated 5 out of5 byThe Juice fromMy Cat Loves TheseI can get my cat from under the bed with one shale of the bag. He loves, loves, loves them. Rated 5 out of5 byKatt fromFantastic product!!!Yes... My cat love all the flavors.... so much so they try chowing through the packaging. 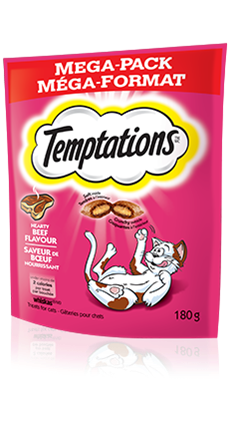 Rated 5 out of5 byMitzi fromMy Cat Goes CrazyWhenever I give these treats to my cat, I am sure to be rewarded with kitty kisses. Rated 4 out of5 byScorpion fromExcellentCats loved the taste and always are wanting more treats.